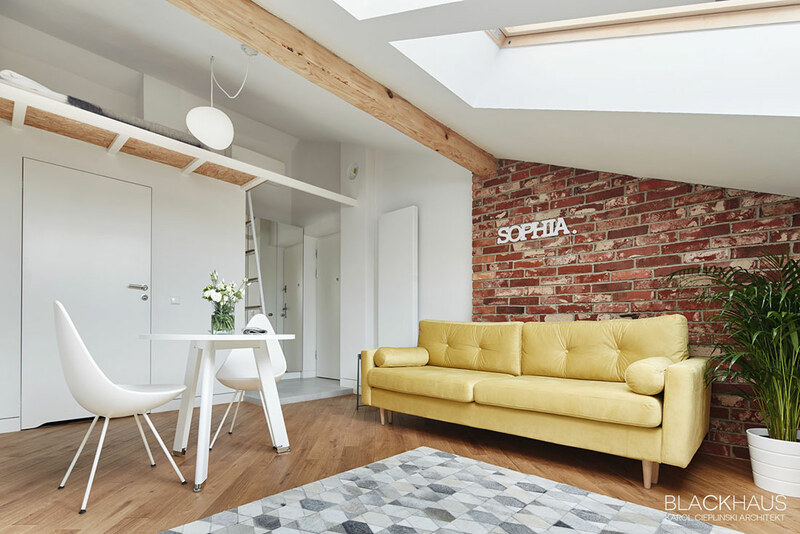 Lofts are a versatile solution to a number of complicated interior design problems. 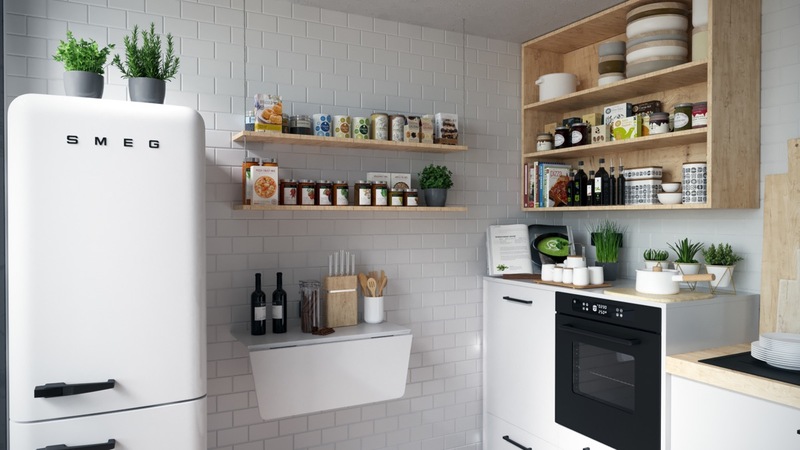 In small apartments, they can expand usable space while putting vertical real estate to good use. 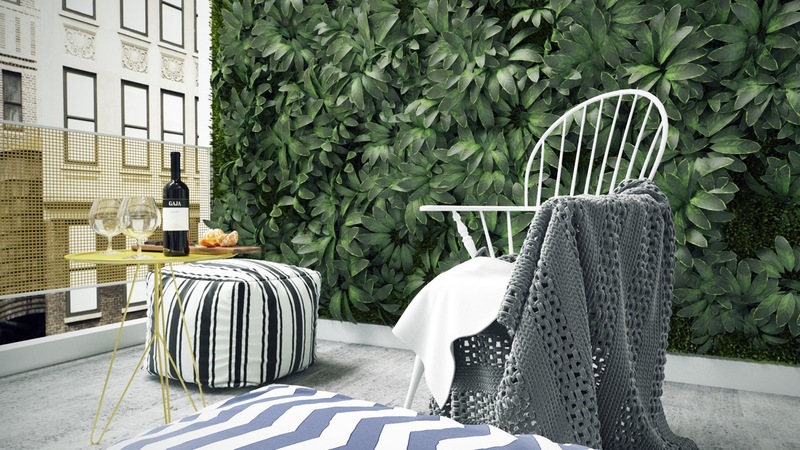 In luxury homes, they can provide a playful and youthful alternative to traditional layouts. In open layout interiors, they can provide privacy without the need for obstructive interior walls. And the list goes on! 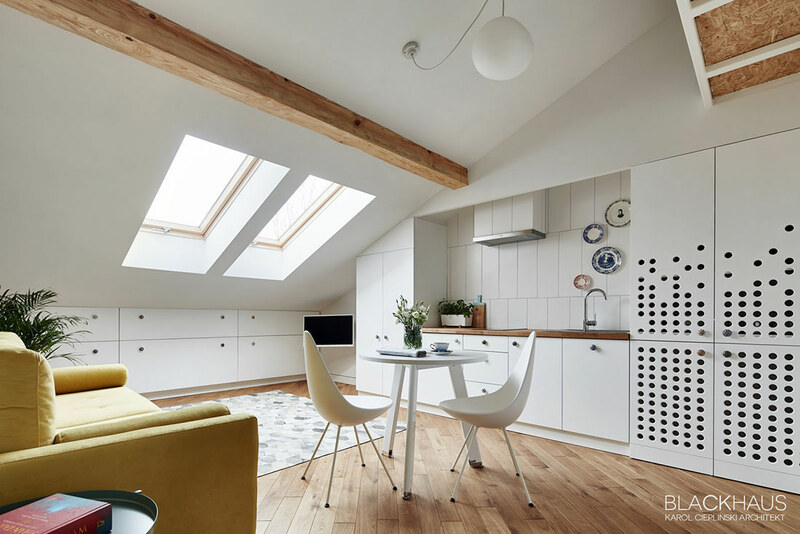 This post examines three stylish apartments with enviable lofted bedrooms – each one taking a unique approach that reflects the character of their respective interiors. Which one is your favorite? 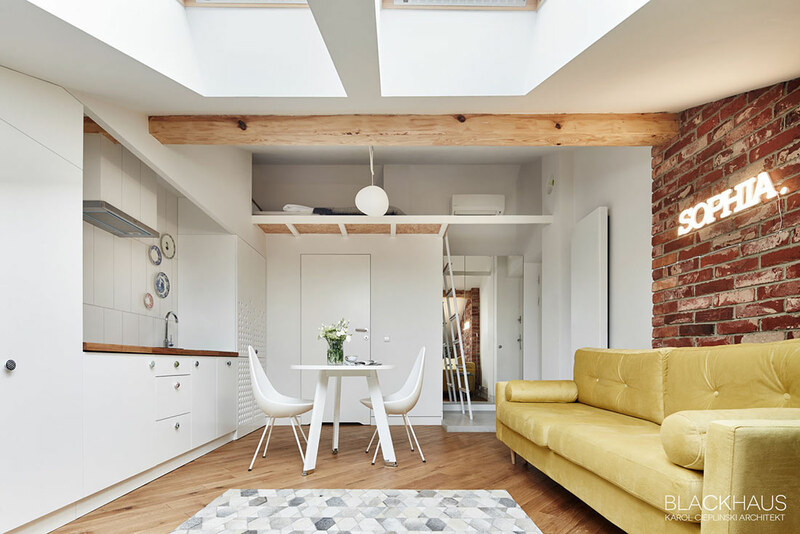 Thanks to its generous windows and impressive ceiling height, this home doesn’t feel restrictive at all – but the floor plan itself is surprisingly compact. 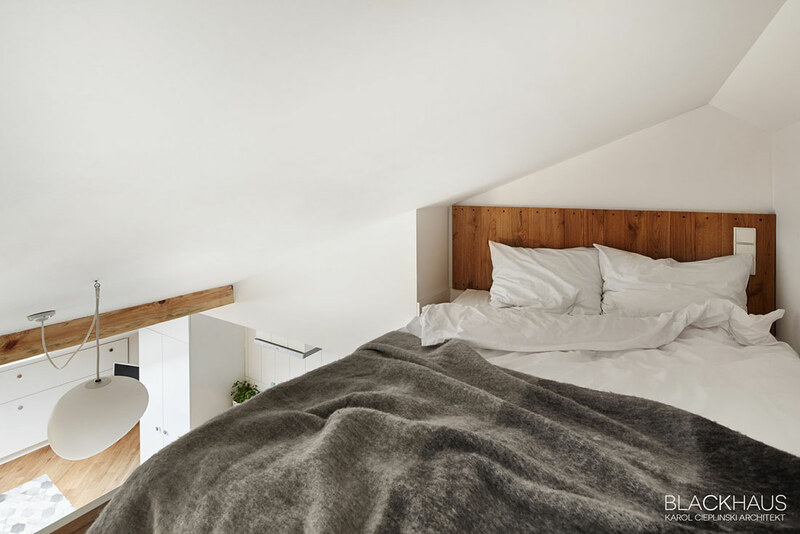 It’s a luxurious retreat in the middle of the city and does its best to foster a comfortable environment with creative layout techniques, including a hidden bedroom atop a lofted platform near the entrance of the apartment. 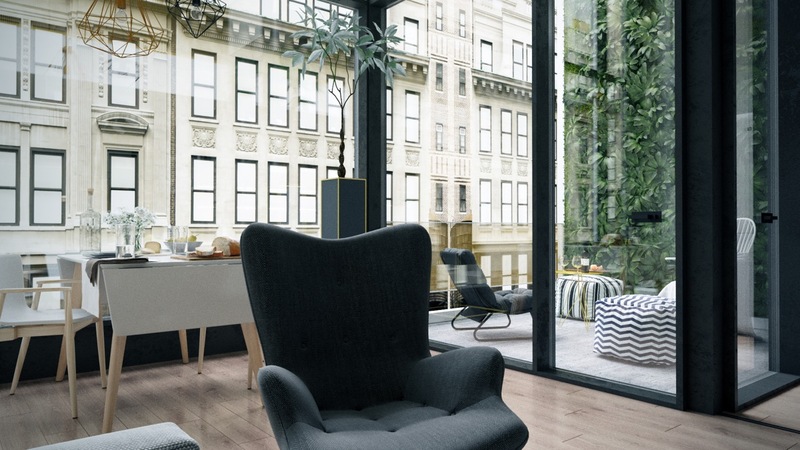 This conservative use of space allows plenty of room for entertaining, projects, and eliminates anything that could get in the way of its distinctive urban view. The living and dining areas share the same space, giving up only a corner to a handsome balcony atrium. Glass walls allow the light to flood the interior. Exciting patterns and yellow accents draw the eye immediately. It’s a versatile space – the simple pair of wine glasses could just as easily be coffee cups, a laptop, or a relaxing book. 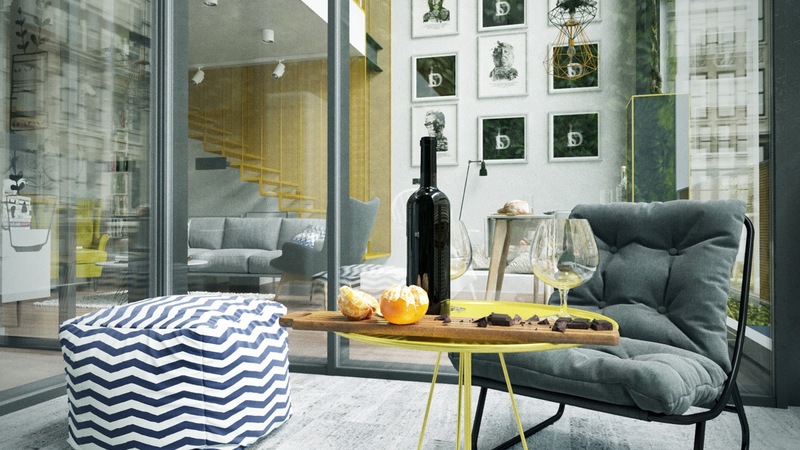 The yellow and grey theme unifies the outdoor balcony with the interior decor. Sticking with one accent isn’t easy, but the payoff can be incredibly satisfying. 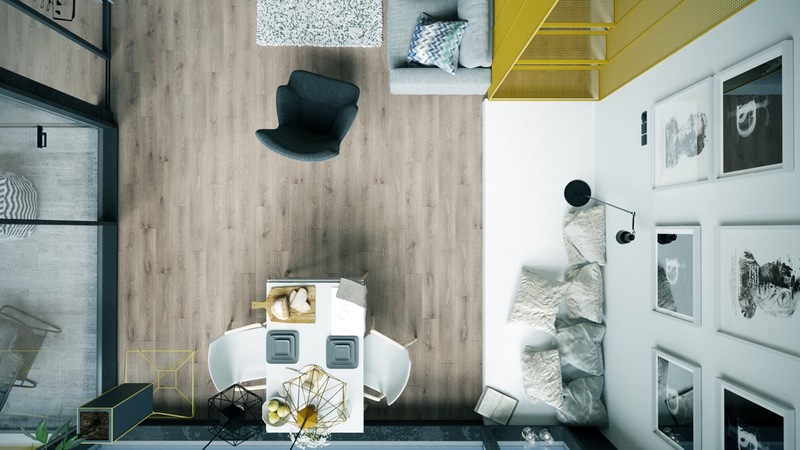 From above, it’s easy to see how compact this floor plan really is. 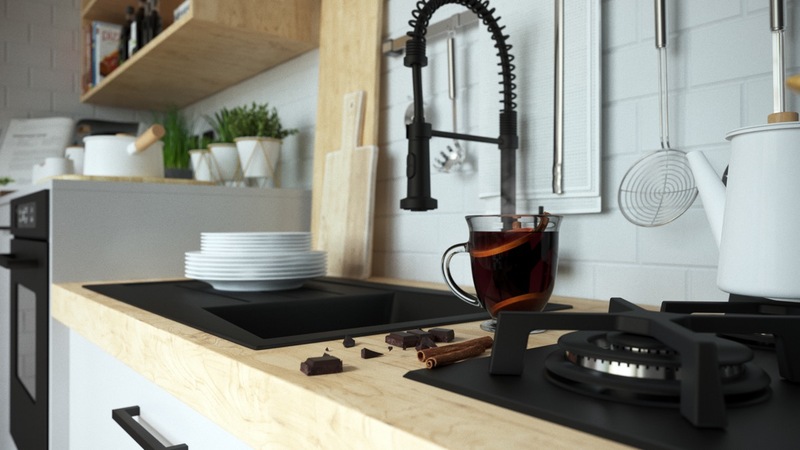 The compact kitchen offers several inspiring space-saving techniques, like the fold-out work table and the attractive open shelves. 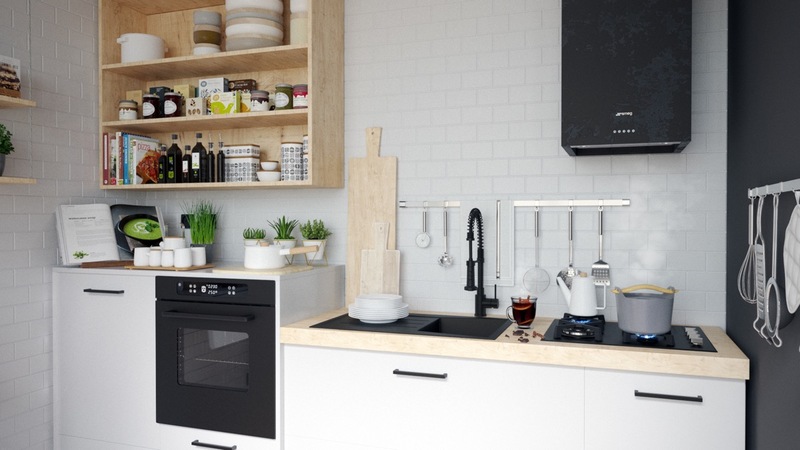 Attractive dinnerware and cookware is a must-have when it comes to kitchens with exposed storage. Even the cutting boards are handsome – and sure to prove useful with the tiny herb garden! 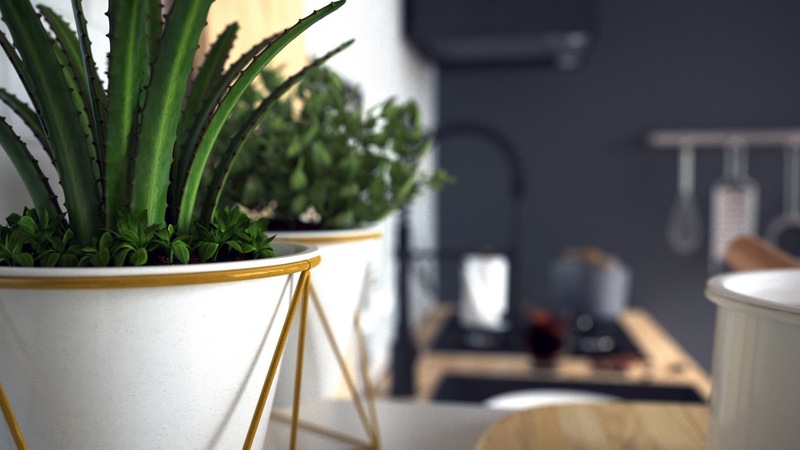 Each pot is equipped with a beautiful plant stand. 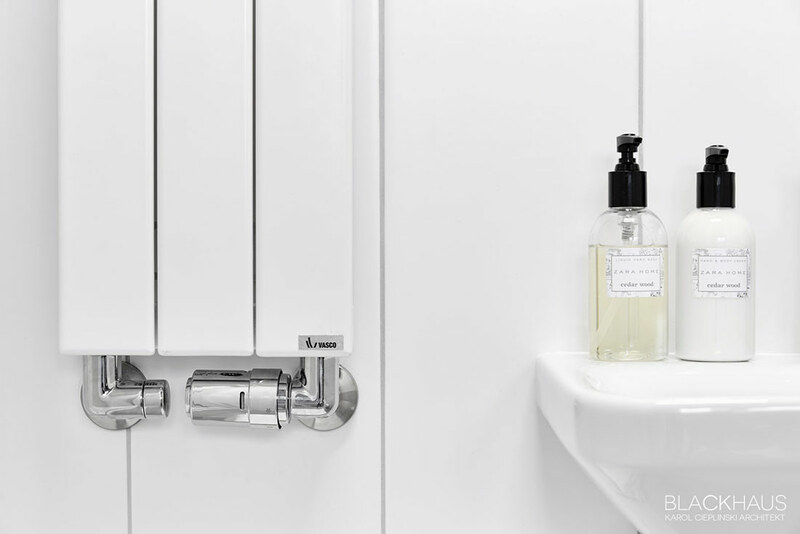 Small details like these can make all the difference in a streamlined interior like this. Cantilever stairs lead to the loft. Yellow metal mesh ensures the staircase is as aesthetically pleasing as it is functional. 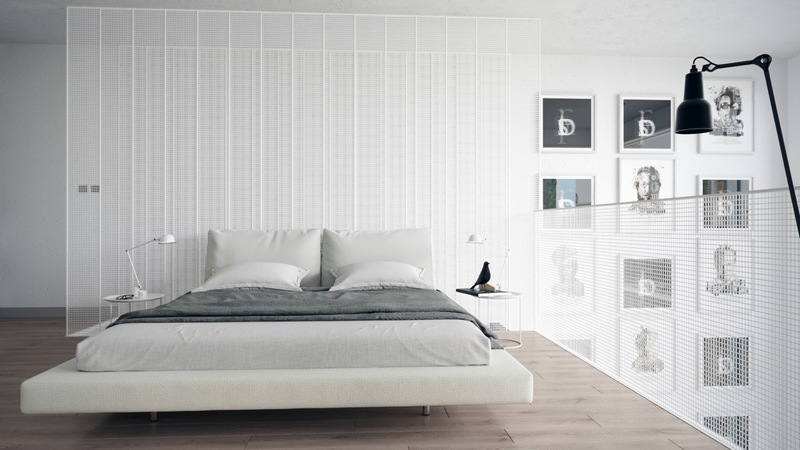 The same wire screens – this time in white – serve as the headboard for the bed and railing for the loft. Bedroom decor remains minimal, just a pair of Jielde-inspired task lamps and an Eames House Bird replica. 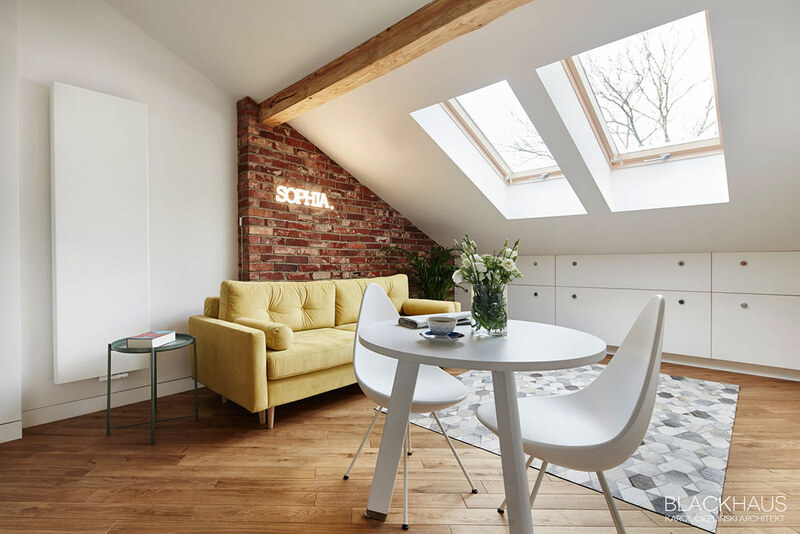 A handsome home office also occupies the loft, accompanied by a well-equipped library. 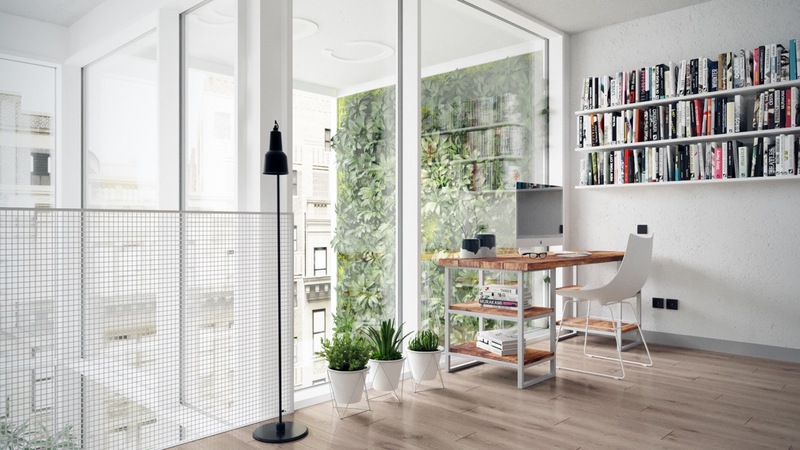 Its view of the tall vertical garden and neighboring facades surely prove inspiring for creative tasks. 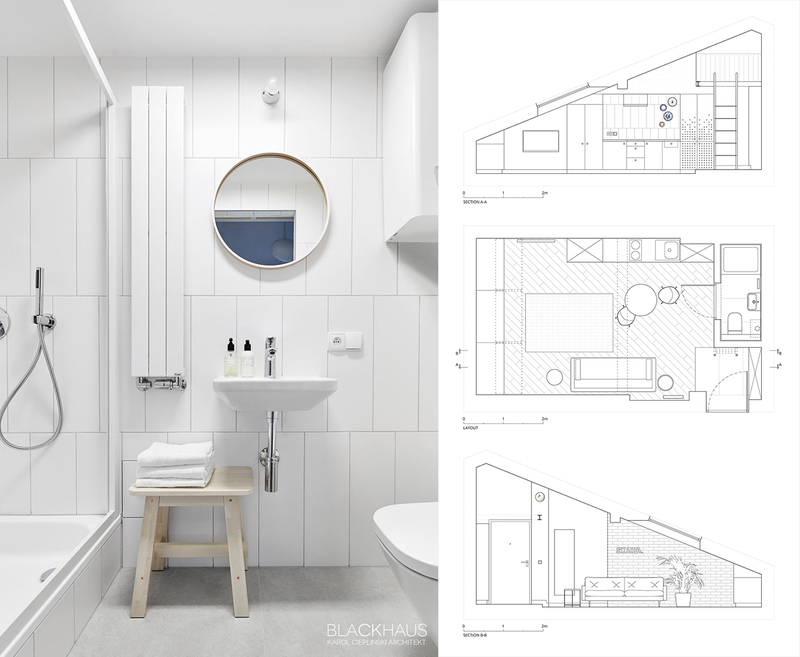 With a slanted ceiling and just 19 square meters of floor space, this compact apartment navigates its restrictions with a smart multipurpose layout to make the best of the given situation. 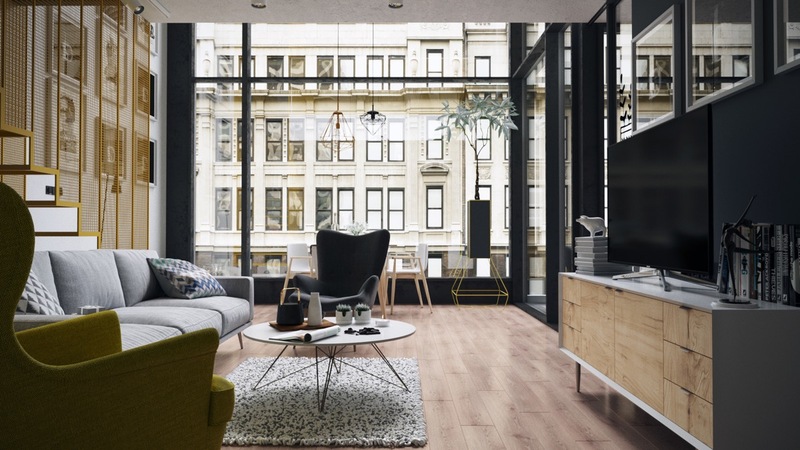 Its handsome interior architecture provides enough visual appeal to reduce the need for extraneous decoration while its abundant storage options hide away any clutter – an inspiring space for aspiring minimalists. 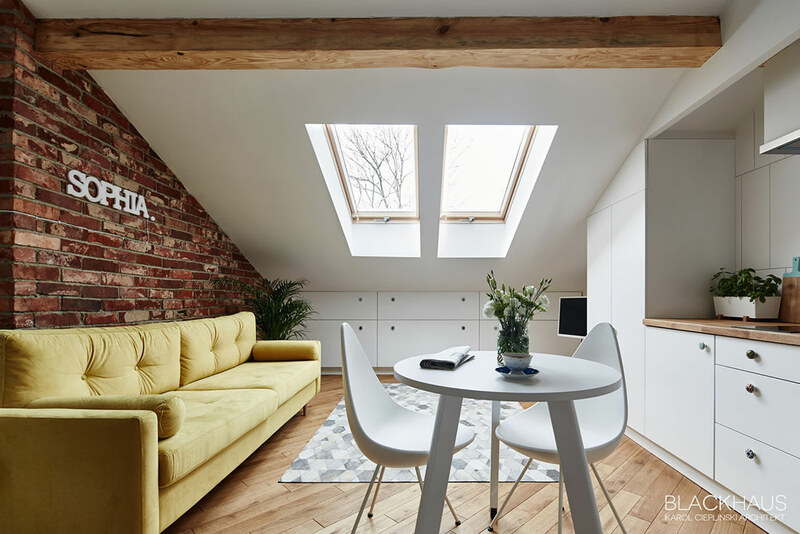 The living room, dining room, and kitchen share the main volume, while the bedroom occupies a loft at the opposite end of the apartment above the entrance. An exposed brick accent wall and warm wood details keep the room feeling cozy. Because of these features, the designer chose to restrict other accent colors – most cabinetry and furniture remains neutral, but the cheerful yellow sofa serves as a strong visual anchor. 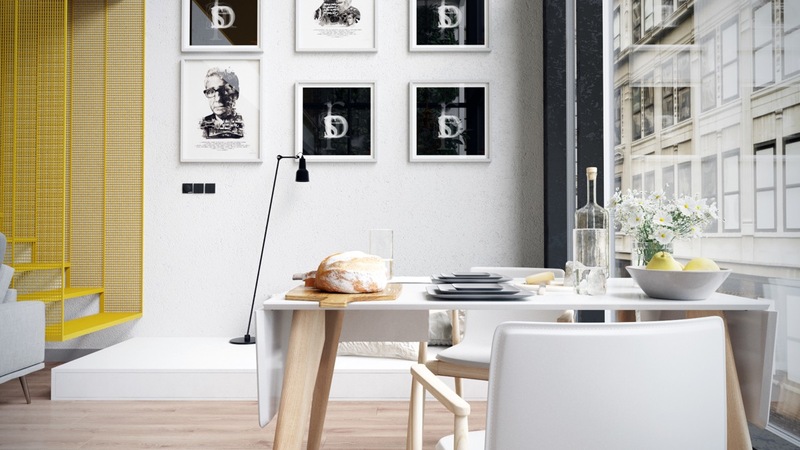 The dining area is especially adorable, a simple table flanked by a pair of Drop Chairs, an iconic design by Arne Jacobsen. 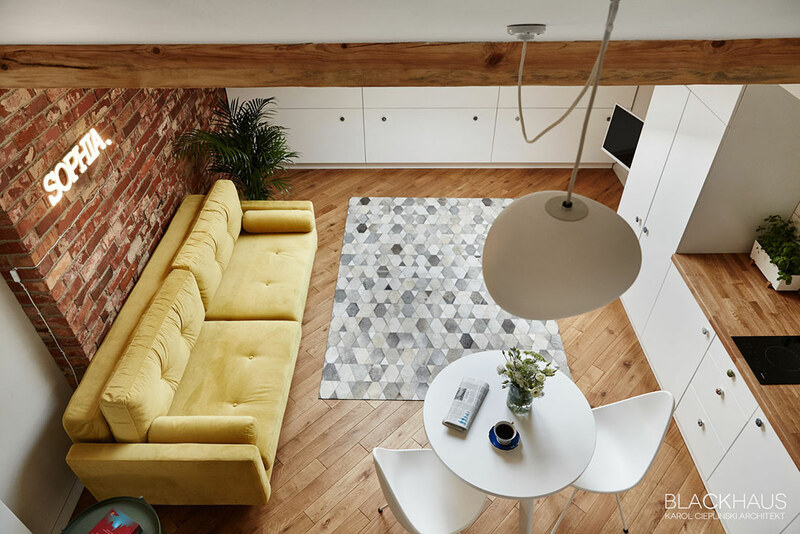 While the white dining set blends into its background for a streamlined appearance, the yellow sofa stands out strong against the exposed brick. 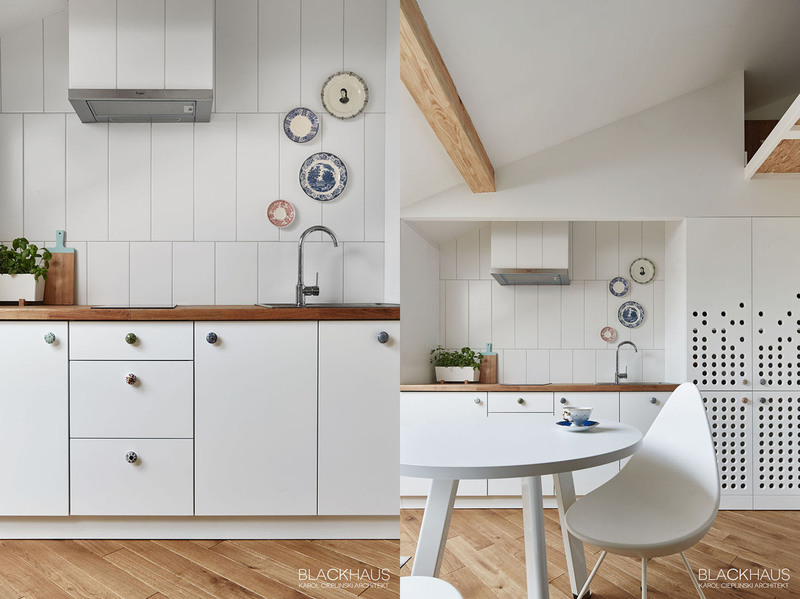 Sometimes designers struggle to give modern white kitchens their own distinctive character, but this space has it in spades – especially charming are the eclectic handle pulls and mounted decorative plates. Now let’s take a look at the bedroom. It’s accessible from a simple ladder, freeing up a substantial amount of space that a staircase would normally occupy. A small wooden headboard continues the natural theme from the main floor. There isn’t much room for furniture like side tables or lamps, leaving nothing to distract from restful sleep. 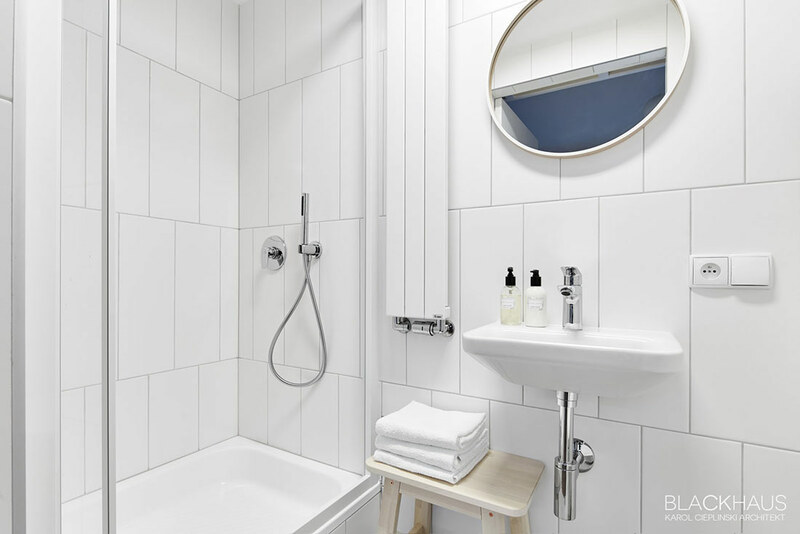 The bathroom uses the same vertical tiles as the kitchen, a unique alternative to the subway tiles so popular today.